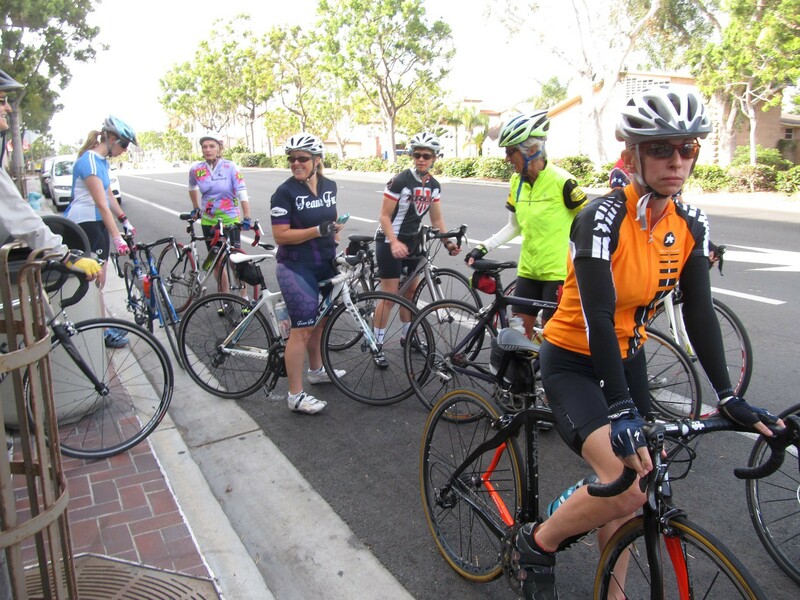 Twenty one energetic ladies showed up at Carlsbad Connection on the Coast Highway this past Saturday to enjoy a ride north to San Onofre and beyond. The C group turned around inside the campground, the B group continued through to San Clemente, and the A group went all the way to Dana Point Harbor. It had been quite a long time since we headed that direction. The weather couldn’t have been better – even the wind that can be quite vicious through the base was rather tame (even on the return trip). I have to make a confession. My long-time riding buddies can tell you that this ride is not exactly my favorite. Maybe it was one too many times of having to return in a hellacious headwind, or perhaps it was getting hunted down by a tank in the tunnel on the Las Pulgas trail. Generally I talk about “suffering through” this ride when I have to, and generally avoid it at all costs. I think that maybe – just maybe – last Saturday’s ride redeems it a bit for me. 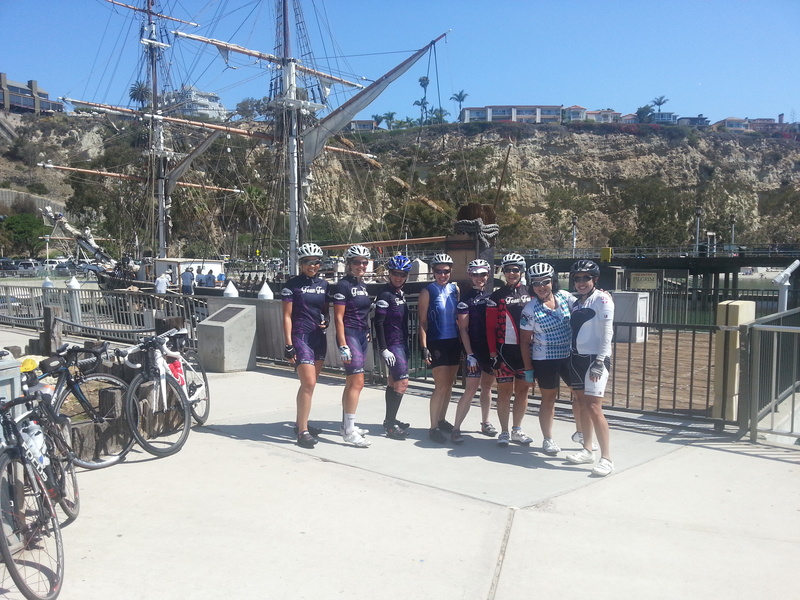 I had nine ladies join me for what was posted as a 65 mile ride to Dana Point (turns out it was a little closer to 70 than 65, but who’s counting). I was a little surprised that so many people were game for the big distance – but I hope everyone would agree that getting to see the harbor was worth it. Karen, Lauren, Ellen, Laurie, Kim, and new attendee Rosio rounded out the group, along with Judy and Candace who joined us for as much as their schedule allowed. The ride started out fairly mellow, that is until we decided to test our legs on the Stuart Mesa climb. I figure since everyone expects me to be a bit of a nut case on hills, and we had so few on this ride, I didn’t want to disappoint anyone. We got the blood pumping and the legs whipping around, and the tempo was nice and challenging all the way through the base (two more little hills until you make it to the bike path). It’s just above pure aerobic training and just below working at lactate threshold. 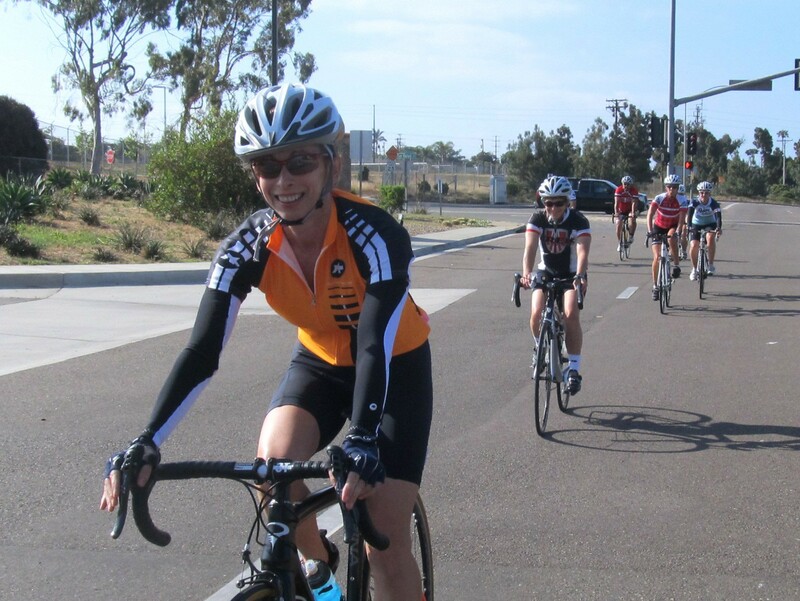 Therefore, tempo riding is not without effort and would be difficult to sustain the required pace for hours, but it doesn’t require so much effort that it quickly tires you out. In a bicycle race, the peloton — or group of riders — often works at this steady pace, performing tempo riding until there is an attack or until they need to bridge a gap. I interrupted and said very innocently, “But why wouldn’t we be doing the whole thing at a tempo pace?”. Obviously I missed the part of the definition where it says the pace would be “difficult to sustain for hours”, and focused more on the parts that say, “just below working at lactate threshold” and “not without effort”. I like those parts of the definition. The other parts seem a little irrelevant, and frankly, boring. I’m kidding, well, partly. I do get a little bit into the “head down, plow ahead” mode when I’m on a long, straight, flat ride. It comes from all those years of riding flat rides into the wind in Idaho, I think. Just get it done, you know? Fortunately the scenery along this route is stunning – for the most part. 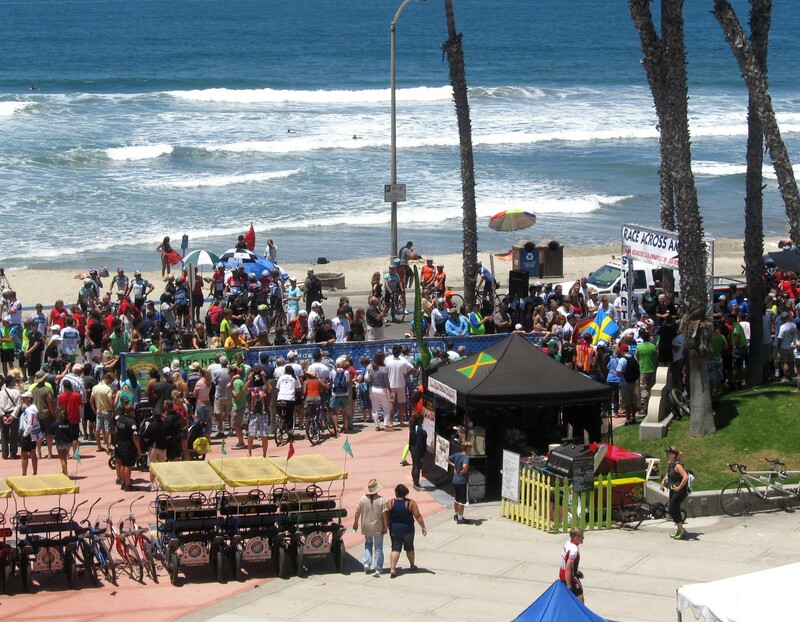 I feel like a completely spoiled brat when I complain about riding along the Pacific Ocean – fresh air, palm trees, vast expanses of deep blue ocean peppered with surfers enjoying the day. With temperatures in the 70s, plentiful sunshine, and light winds – it doesn’t get much better. In what seemed like no time at all, we were enjoying the high speed rollers that the bike route follows through San Clemente. Sling shotting from one to the next, it’s a bit easy to miss the green bike route signs, but we managed to make our way down to the north end of town. 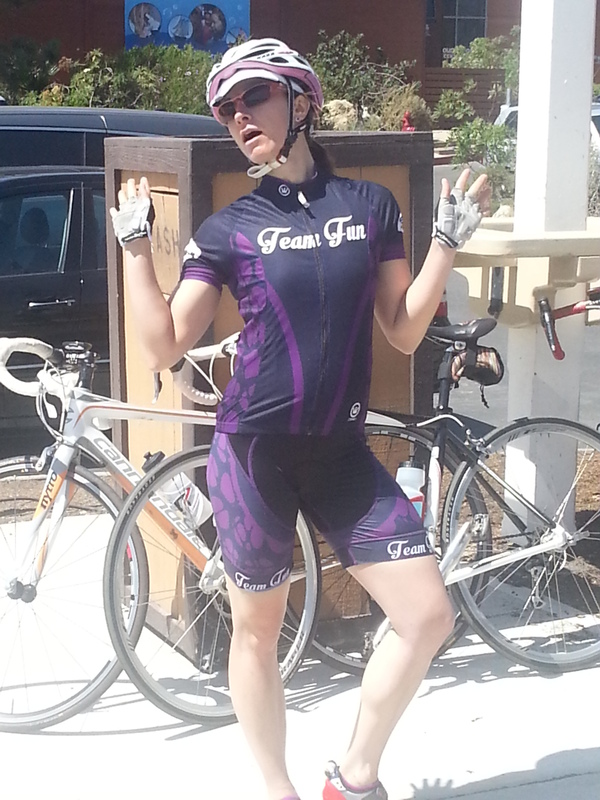 We took a little refill and potty break at the coffee shop before heading onto the last stretch to Dana Point. There was some talk of maybe getting a snack on the return, but everyone was pretty determined to make it to the halfway point before relaxing for a food break. Personally, I was a little hungry but I went with the mood of the group. 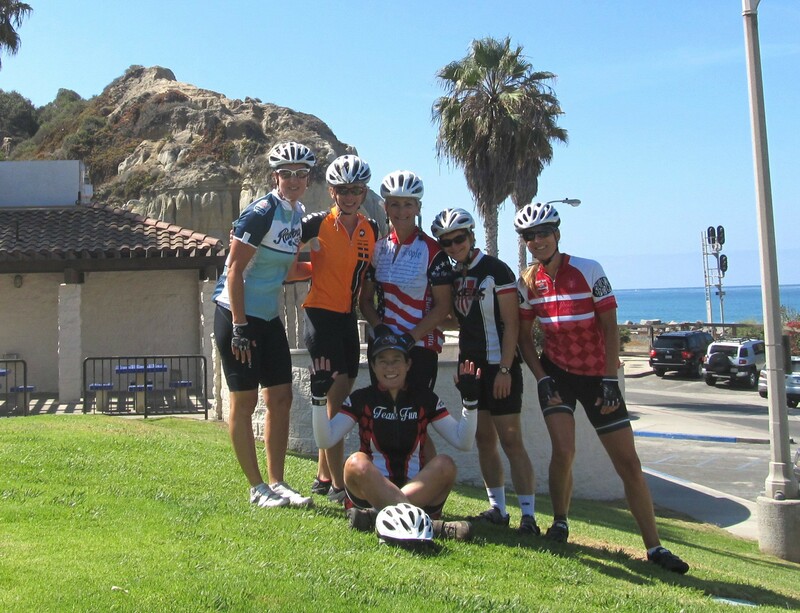 We were a little clueless about how to jump onto the bike path past San Clemente, but fortunately we jumped into the middle of a group ride from a bike shop in Dana Point and had the pleasure of drafting a gracious, very fast cyclist who pulled us along north of 24 mph. 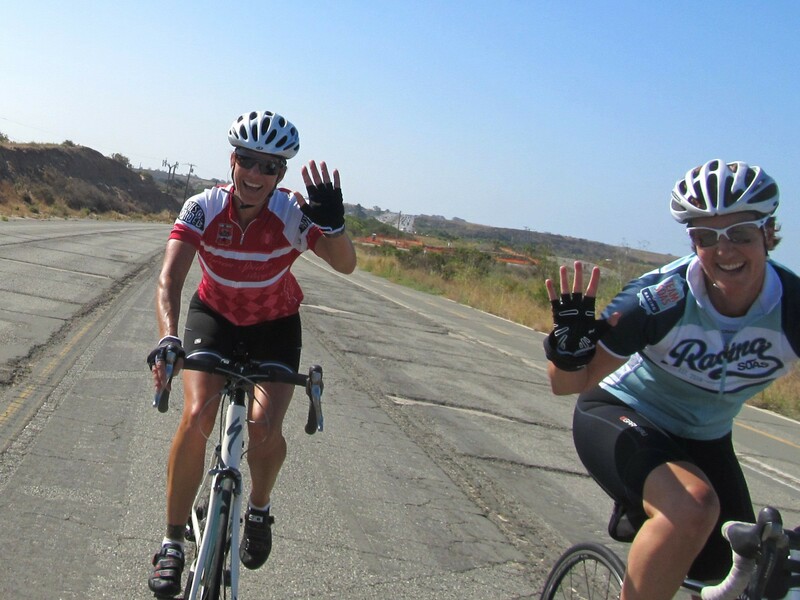 Kim had already been pushing the pace upwards of 22 mph or so, prompting me to ask why she was in such a hurry to get to Dana Point, but I decided to stop complaining and enjoy the draft. The group also pointed us in the right direction toward our destination – the harbor. I had no idea how big the harbor was there, and we took some time to do a mini photo shoot. We all bemoaned the absence of our team photographer, Jill, but we managed to squeak out a few good ones. A few people tried to tempt me with this steep, beastly looking hill that climbs out of the harbor, but I declined. I think it was a little plot to tire me out, but I knew how tired I was already feeling and with facing down another 45 miles, I decided to choke down the cliff bar I had packed. Return trips are never as exciting as the trip out, and given that it was already a pretty long day, we decided to forego the snack back at the San Clemente coffee shop to head back to Carlsbad. My stomach was very grumbly at that point, but following the advice of some of my fellow riders, I decided that every time I felt the hunger pangs, I should just push a little harder. Kim was quite the task master on that return trip, just jamming up every incline, in spite of my pleas for mercy. She was heartless. Truth be told, everyone finished strong. We are definitely ready for a Team Fun century effort! I heard nothing but great reviews from all three groups, so I think in spite of my historical bias against this ride, I think it should be included in our regular ride rotation.